Winter has arrived in Australia and that begs the question from many Australians - “where shall we go for a cosy winter weekender?” Here’s my answer – the Hunter Valley region of Broke Fordwich. Fondly referred to as the ‘tranquil side of the Hunter Valley’, this romantic and picturesque hidden gem connects the foothills of the stunning Brokeback Mountain Range and history vineyards. Whilst most people journey up to Polkolbin, I cannot recommend highly enough to visit Broke Fordwich – it’s the indie version of the Hunter Valley! I recently drove up to the region for a weekend getaway and indulged in wine tasting, eating, exploring, more eating and more wine tasting - read more here. For those who don’t have a lot of time, below are three places definitely worth visiting! Margan Restaurant Margan Restaurant is set upon a 320-acre state of the art vineyard. Established in 1997, Margan wines are setting quality benchmarks for the production of Hunter Valley wine. Hunter born and bred, the Margan family is very passionate about food, which is inspired by the seasons. The one acre Kitchen Garden, which is only a few short metres from the restaurant and free for guests to roam amongst, and orchard produces up to 90% of vegetables and fruit for the seasonally inspired menus. In addition, Margan have free range chickens, Black Suffolk lambs, bee hives and olive groves. Offering guests a sophisticated dining experience in a charming rural setting, we settled in for a gastronomic lunch and indulged in a three-course meal with matching wine. 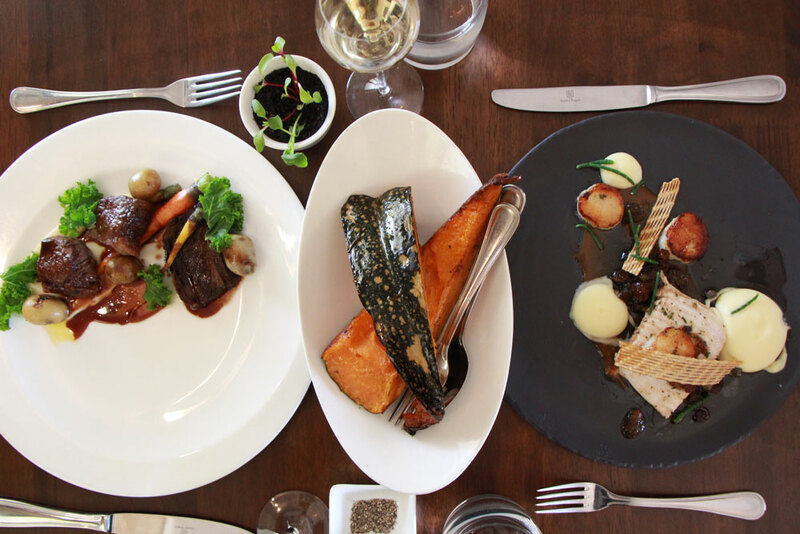 You can’t come to the Hunter Valley without having lunch at Margan – it would be a crime to do otherwise. Glenguin Estate First planted in the 1980’s, the average vine at Glenguin is now 25 years old giving weight to the Estate’s practices of sustainable viticulture using organic practices. We sat down with a group of wine enthusiasts and were taken through a detailed wine tasting inside the property, which is also home to the patron of the vineyard. Glenguin wines are literally handmade with handpruning and handpicking followed by small-scale hands on winemaking. Each wine is made in very limited quantities. It literally is an exclusive and delicious experience! Catherine Vale Winery What do you do when you’re from the US and love wine? You move to Broke Fordwich to start a winery. That’s what vineyard owners Bill and Wendy Lawson did. Fast forward to today and they have created from scratch a beautiful vineyard producing small parcels of quality fruit from six different varities. The end product? An award winning wine. We were very lucky to sit down and sample select wine from the vineyard with local cheese whilst sitting on the deck overlooking the hills of the Broke Fordwich region. Heaven!